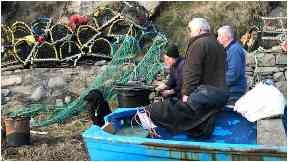 The men had to move their boats following a long-running dispute with the landowner. A group of fishermen in Aberdeen who were ordered to move their boats from part of a harbour are launching a crowdfunding campaign after being hit with a legal bill for thousands of pounds. 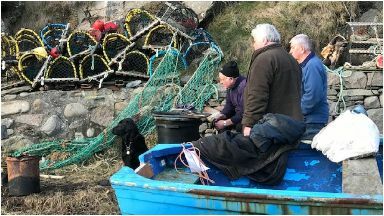 In a court ruling last year, the men were ordered to move their boats from a section of Cove Bay Harbour, following a long-running dispute with the landowner. They say they've now received a bill for legal fees totalling around £45,000. The news comes a few days after an unrelated incident in which a fire damaged five of their boats. "It just rubs salt into the wounds," said fisherman Bill Westland. "But what can you do about it? I've lived here all my life. This was our playground when we were children. "Now we're fearing for our livelihoods." Fellow fisherman George Skinner added: "To get this on your doorstep, right after what happened two, three days before. It's just devastating." The men said they remained resilient and were determined to ensure fishing continued from Cove Bay Harbour for many years to come. "Hopefully we can raise some money," said Jim Adam of the Cove Fishermen's Association. "I think it would be a tremendous shame if we were to lose the fishing activities altogether out of Cove." The landowner involved in the court case told STV News he did not wish to comment on the issue of the legal costs.